We've got twice the treats! Like candy? Then enter our Goodie Giveaway below, and you could win a box worth $50 filled with your favorite Halloween candy! "As the editor of a holiday website, I see a lot of creative Halloween ideas - crafts, recipes, decorating tips and costume ideas start coming in from my writers when October begins. 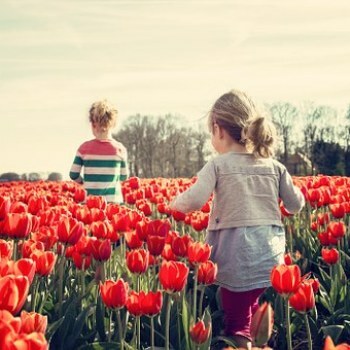 Through the years there are some ideas that I've adopted and are now my go-to’s every year. The common denominator to all these crafts and recipes is that they are super easy, which I am all about. 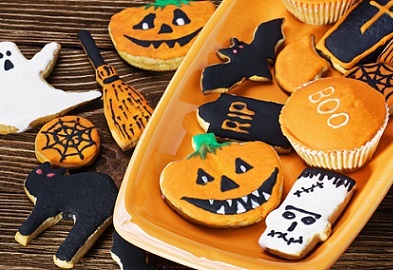 When I need to bring a dish to a party or an activity to do with the kids, these are my favorite EASY Halloween tricks I have up my sleeve." 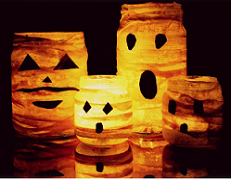 With a new baby this Halloween, I can truly appreciate DIY and crafts that are easy without necessarily looking it. That’s one reason why I love this decorative craft. 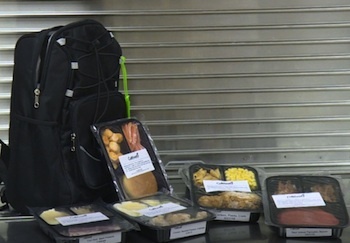 It’s cheap to make and you might even have everything you need around the house. 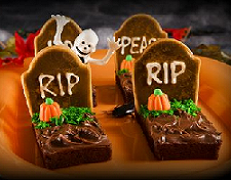 This Halloween treat is one of my favorite go-to recipes for parties. They are easy enough to make, since they are only semi-homemade, and they really make me look more creative than I think I am. kids will love to make, and eat these brownies. 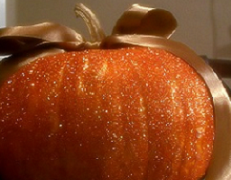 One reason I love this glitter pumpkin craft is because it can be used for Halloween and Thanksgiving. It is a great inexpensive centerpiece for an elegant Fall bash. These Halloween appetizers are so ridiculously easy, and both kids and adults will love them. For bite-size appetizers just use cocktail weiners. For a slightly more upscale version use phyllo dough and sausages. 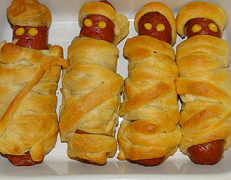 If your kids are free have them help you create the mummy dogs; they'll love making them as much as they love eating them. Special thanks to Daisy! To enter the Goodie Giveaway* comment below by October 13th and tell us all about your favorite Halloween candy! And now to get the party started, how about a little "Monster Mash?" *Open to US residents only. No purchase necessary. Winners will be randomly selected and notified on October 14, 2013. UPDATE: Giveaway has ended. I used to get homemade taffy from an elderly aunt. I also love popcorn balls but I guess that's not candy. Reese's and Kit-Kats for sure. My favorite Halloween candies have always been Reese's Peanut Butter Cups and Peanut M&Ms. What even ARE those orange & black wrapped THINGS that some people insist on giving out? I am in love with Almond Joy and Butterfingers!!! Who can resist candy corn! My faves are Candy Corn, and M&Ms, - love to eat them, decorate with them, and make trail mix with them! I also love Lindt dark chocolate balls, they are my evening indulgence. Milk Duds! I love them... Also Dots! My teeth hate both, but I can't resist them! Mounds and Almond Joy and Snickers!